Always have the right length bungee for the job. Adjust the length to suit any application. Avoid stretching your bungees too much and promote longer life. Fewer bungees handle a multitude of situations. 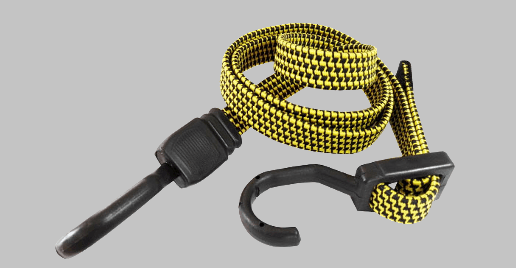 ProTuff Adjustable Flat Strap Bungee Cords are designed to secure just about anything without damage. With an extra-wide woven design, these straps provide a strong and secure hold that won’t dig into softer items. Our “extra long” strap adjusts from 10” to 55” long and the coated steel hooks are stronger than conventional hooks. The UV resistant cords are color coded by length for convenient selection. And, don’t forget that every ProTuff Product we sell comes with a lifetime, no questions asked, unconditional guarantee. If ever you have a problem with your ProTuff bungee, simply let us know and we’ll make it right.